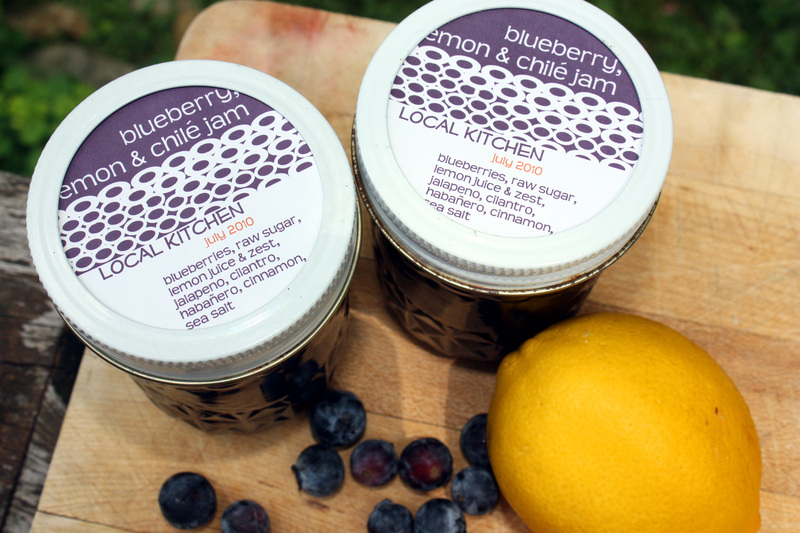 Run, don’t walk to your nearest blueberry patch and make this jam while blues are still in season. This one is classic Nischan: pure blueberry flavor, accented with the tang of lemon, and just enough sweetness to off-set the surprise heat of jalapeno and habanero peppers. So good that this is my second batch in as many weeks and I’m contemplating a third. Worth firing up the canner on a 90-degree, 99% humidity July Sunday – it’s that good. Zest the lemons with a sharp vegetable peeler (taking care to remove only the yellow and not the white, bitter pith) and then cut the strips into a fine julienne. You should yield a generous 1/4 cup of zest (add more zest from another lemon if necessary). Juice the lemons, straining out seeds & pulp (about 1/2 cup juice), and add jucie & zest to the blueberries, stirring well. Add remaining 1 cup of blueberries and chopped cilantro. Taste and adjust flavors; remove cinnamon stick. Bring to a boil and cook for 1 to 2 minutes (to allow berries to heat through). Remove from heat and fill hot, sterilized jars to 1/4-inch headspace; wipe rims, affix lids and process for 10 minutes in a boiling water bath. I made minimal changes to the original recipe: Nischan called for 2 and 1/4 cups sugar, only 6 cups blueberries (he did not add any whole berries at the end) and he did not add lemon juice. Other than that, my recipe is the same as his and it is truly exceptional. Because of the long, slow cooking method, this is one of those jam recipes that I suspect you could safely double (Update: yes, you can. Use your widest pot or a large skillet with a splatter screen). Nischan claimed a yield of 10 half-pints: I don’t know how that is possible considering I followed the recipe almost exactly (even added more blueberries) and yielded 4 half-pints (my yield with a double batch was exactly 8 half-pints). Canned, store in a cool, dark spot for up to 1 year (although Nischan specifies a 6-month storage time). Refrigerated, should last at least 1 month. 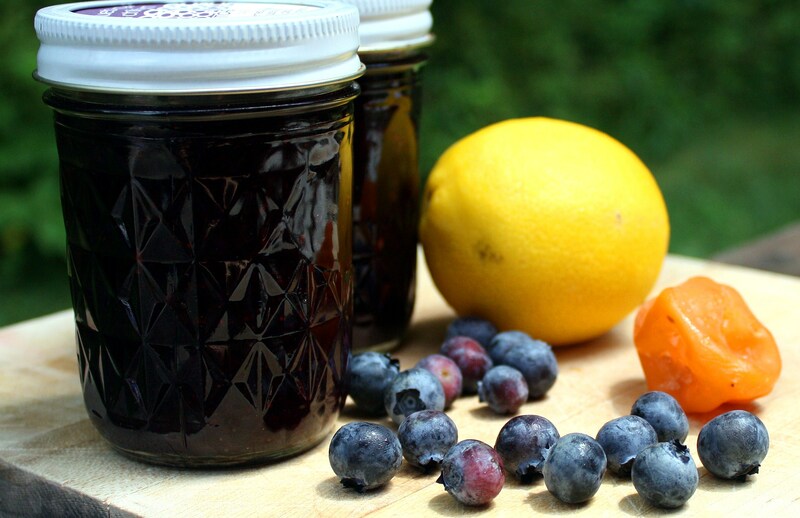 Blueberries are in season in summer, but with frozen berries you can make this jam year round. Do you sell you jams? I see your lovely labels and was curious if they are available in the Hudson Valley. Hi at the farmers market: No, I don’t sell my jams (although everyone tells me I should). I’ve felt that given the time, effort and expense of the ingredients, it would never be a money-making endeavor; besides, don’t think that I would enjoy coming up with fabulous, unique jams (like this one!) and then finding out that all everyone wants is straight-up strawberry. 🙂 But thanks for asking! That’s a lovely compliment. I do give many jars away every year, for Christmas and other occasions, so I try to make the labels a bit fancy for gift giving. Robin – you know I thought the same thing! I don’t have any kids, but I have a good friend who gets a lot of my jam experiments, and she and her 6 year-old daughter are always fighting over the last bit in the jar. This one she may be able to enjoy all by herself! How are you serving this? Would it work well with grilled chicken/pork? Ironically, I have plans for a similar jam without the habenaro but this sounds even better. Honestly, I’ve just been eating it on toast (and I’m much more of a peanut butter toast girl, so that’s how good it is). The chile doesn’t really give this much of a savory note; just a sweet heat. That said, I’m guessing it would be wonderful paired with goat cheese on a cheese plate, or as a blueberry tart glaze with a less sweet filling; maybe lemon curd or cream cheese. I have ideas to dilute with white wine vinegar for a salad dressing, and I would guess it could make a great grill marinade for either chicken or pork. I think I am on the right track. Thanks for taking the time to respond. I’ll be cooking up a pot this week! I made this last night and oh my goodness, I’m in love! Thank you for sharing it! I may have to pull more berries out of the freezer to make more! I’ve made two batches of this since Saturday. I think it’s just about my favorite jam this year, even eclipsing fig, ginger and lemon. The proportion of sweet, tart and hot are perfect; and even my chile-leery youngest son adored it. The scrapings from today’s pot are going to glaze tonight’s grilled chicken, and we will thank you as we eat. Isn’t this one wonderful? It’s one of my favorites as well. But thank Michel Nischan – this one is all him. Enjoy your dinner! I have chicken going the grill myself – am wondering which of my multitude of open jars is going to win Glaze Of The Day. I am so happy to have found your site, I have bookmarked tons of your recipes to try! This one is going to be today’s project 🙂 This might be a totally stuipd question but I have never toasted a cinnamon stick, will it break up into bits or do I remove it before pouring into the jars? The cinnamon stick will not break up; you remove it prior to canning. Thanks for asking – I will update the recipe accordingly. Good luck with the jam – I hope you like it! I’m always skeptical about spicy/savory+sweet pairings, but you’ve yet to lead me astray, so I’m making this jam RIGHT NOW with the berries I picked this morning. I’m sure it will be wonderful; 20 minutes into cooking it, it already smells great. I LOVED this! I had to make it with frozen blueberries because fresh was a bit too expensive. Could not get it to gell. Added almost another cup of sugar. I think it might have been due to the berries being frozen – maybe/maybe not. I did go with a whole habenero and 2 jalapenos – I didn’t use the measuring spoons. Ended up with a sweet (bit too sweet – sugar overrode the blueberry) – but with a nice low heat underlying it. The majority of the people who tried it – enjoyed it. I served it on pound cake. Great recipe. Thanks so much for sharing. Glad you liked it; the gel issue could have been that your blueberries were late season or simply didn’t have as much pectin as the ones I’ve used in the last couple of years. Fruit always seems to vary year to year and I often add sugar at the end if I can get it to reach the gel stage. One good trick is to add both sugar and lemon juice (or other acid): not only does it cut down on the over-sweetness factor, but the extra acid can also help to achieve a good set. Only correction is – I loved it – not liked it. I’ll come back and see what other wonderful things you are concocting. Holy cow! This is wonderful! I added a bit more pepper (one more jalapeno with some seeds and the other half of habanero) only after it cooked a bit and I tasted it for heat. The family loved it. Mine made almost 7 half pints. I guess it really depends upon the fruit. Thanks for the recipe. I will be making more of this and checking out your blog for more yummy stuff. Hi, read your blog for first time and got totally inspired,’!,,,,,,,!!! Today I made spicy plum grapefruit jam! Got any recipes for elderberry jelly? I just found you and your recipie and was hoping you’d find this comment as well. I really want to make this jam, and am excited to add the peppers to it. I really want to taste blueberries, so am wondering about the lemons. If I eliminate the lemon and rind, can I use certo pectin? and also…the cilantro….will that be noticeable? I love that there is only two cups of sugar, because I don’t want it to be sweet. I really recommend that you try it once, perhaps a half batch?, with the lemon juice & rind. It’s the marriage of flavors – blueberry, lemon & chile – that really make this one a winner. If you simply must, then I would suggest keeping in the lemon juice for acidity and omitting the lemon rind. Because of the long, slow cooking time, this jam doesn’t really need much in the way of pectin: I think you’d be fine without using certo, even if you choose to omit lemon rind. Also, bear in mind that the sweetness of 2 cups of sugar is offset by the lemon + rind; decreasing the sugar even further, however, if you omit lemon, may make it difficult to achieve a jammy texture or set. The cilantro is very subtle, but can easily be omitted if you choose. Good luck! This one is one of my favorites. Thank you for such a quick reply. I think I’ll follow your instructions for my first try. I am always leary when i have to add lemon juice, as I worry that is all I’ll taste. I’ll post my results and I have a feeling I’m going to be glad I gave it a try!! Forgot to mention…I’ll be using frozen berries…any think different I need to do? mabey be a little more generous with the berries?? Not really: they might just need to cook down a little more. If you want to maintain the freshest berry flavor, you might strain the juice from the frozen berries, reduce that down separately, then add berries, sugar etc. to make the jam. Well, I finished the jam. My berries were frozen, so when they were partially thawed, I used the emersion blender. I am not sure I’d do that again, because I can feel the seeds (does that make sence?) I was a little shy on lemon rind, so finished it off with orange rind, and used regular sugar, cause that is what I had. I didn’t have sea salt, so used kosher. I’m not positive I love the cilantro, but I don’t hate it. I have eaten half a jar to confirm my findings…. I find the texture a little grainy because I used the immersion blender. Next time, I’ll wait a little longer and just mash them. (patience is not one of my better features…lol) The seeds will still be there if I mash them, but won’t be as noticeable because of the crushed berries. I cooked it down in the time you suggested as well….45 min. It did set too, and i never drained anything. I’ll be making this again….with a touch more patience, and will debate on the cilantro. Thanks so much for suggesting I give it a chance as an original. Hot damn, girl…this is amazing! Thanks for sharing the recipe! I have an good supply of berries this year and am planning to do this soon! My most recent jam was Blueberry Lime Basil. It was NOT a disappointment. This one looks fabulous! Thanks! !